A large area divided unequally between the former commotes (later lordships) of Kidwelly to the south and west, and Iscennen to the east (Rees 1953, 174). 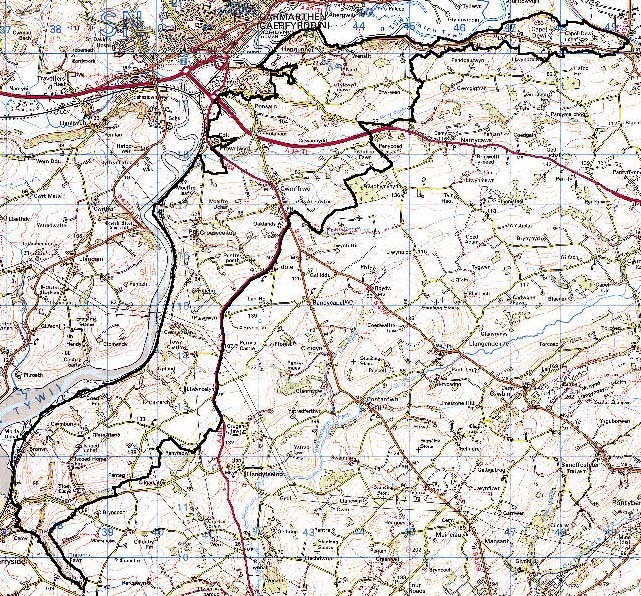 The living landscape has great time-depth in that the course of the present B4309 partly follows the line of the Roman Road between the fort at Loughor (Leucarum) and Carmarthen (Moridunum), and Abercyfor, near Cwmffrwd towards the north of the character area, is one of Carmarthenshire's more convincing sites for a Roman villa (James 1980, 16). The church of St Ceinwr, also to the north of the area at Llangynwr, may have pre-Conquest origins and was an important Medieval parish church. The Lordship of Kidwelly had been in Anglo-Norman hands since c.1110 but Iscennen remained nominally independent, unlike the rest of Cantref Bychan, until 1284 (Rees 1953, xv). In 1327 Kidwelly passed to the Duchy of Lancaster followed by Iscennen in 1340 (ibid.). Despite this duality of tenure, land management during the historic period appears to have been much the same in both parts of the area which, with the exception of the southern part of the area which lay in the foreignry of St Ishmael (Rees 1953, 175-212), were held as Welshries during the Medieval period (Rees 1953, 220). In fact much of the higher land to the south and east of this area was common pasture, part of Mynydd Kyvorth and Mynydd Ucha commons, the majority of which was enclosed by a number of private individuals - major freeholders such as the Stepneys, Morgans and Philippses - during the 16th- and early 17th-century as recorded in some detail in 1609 (Rees 1953, 243-9). It is thus probable that Area 187, with its smaller, more irregular fields, was enclosed at an earlier date, possibly in the form of later Medieval encroachments. The 'Island' of Cystanog, in the Tywi Valley to the north of the area, contained 'small quantities' of the lordship of Widigada 'commonly called yr ynys ucha, which parcels are intermingled in and among the Duchy lands' (Rees 1953, 235). Abercyfor had become the site of a gentry house by the 16th century, when it was a residence of the Dwnns of Kidwelly, noted commentators of the time (Jones 1987, 1). Another early house is at Beaulieu Fawr. The gentry house at Iscoed, in the south of the area, was first recorded in the early 17th century and remained in the hands of the Mansel family until 1772 when a new mansion was built; both were sold to the Pictons after 1804 and their environs were emparked (Jones 1987, 94-95). Towy Castle, despite its name, appears to be a new house from the late 18th-century, first mentioned in 1794 (Jones 1987, 182). A further gentry house at Cystanog has gone; land within its curtilage was exploited for lead mining in the late 18th century. The B4300 along the south bank of the Tywi is marked on early 19th century maps and its presence encouraged the growth of a village around the nonconformist chapel at Capel Dewi; however 'Chapel Dewi' was mentioned in the early 17th-century (Rees 1953, 301). A further 19th century new village, with a contemporary church, lies on the B4309 at Cwmffrwd south of Carmarthen; both villages have been subject to much 20th century development. This very large historic landscape area lies across low rolling hills on the southern and eastern side of the lower Tywi valley. It rises from sea level at the River Tywi to heights of over 120m on the summits of rounded hills southwest of Cwmffrwd. The area is characterised by scattered farms set in medium-sized irregular and regular fields of improved pasture. There is a little rougher and rushy ground, particularly at higher levels. Fields are defined by earth banks topped with hedges. Hedges are generally well maintained, though some neglect is evident in those at higher levels. Some hedges possess distinctive hedgerow trees. Stands of deciduous woodland are concentrated on steep valley sides, with few small conifer plantations on high ground. There is an area of former parkland around Iscoed Mansion. The settlement pattern is dominated by dispersed farms. Farmhouses mostly date to the late 18th- and 19th-century, are stone-built and rendered, with slate roofs, of two storeys and of three bays. Most are in the vernacular tradition. Stone-built farm buildings are associated with the farms. On the larger farms these are substantial and occasionally laid out on a formal basis, but most are of one or two ranges informally located in the farm yard. Large modern farm buildings are present on most holdings. Superimposed over this ancient pattern of dispersed farms are more recent settlement patterns. Croesyceilog is a small linear hamlet with a core of 19th century stone-built houses and cottages interspersed with which are modern dwellings, mostly brick-built. Cwmffrwd is essentially a 20th century village of individual houses, small housing estates and garages, though it includes some older 19th century elements, strung out along the A484 and a B-road. Capel Dewi similarly has an old core, but is essentially a 20th century hamlet. Several other major and historic roads in addition to the A484 - which lies on the route of a presumed Roman road - radiate out from Carmarthen across this area. All of these routes have attracted 20th century linear development. Other 20th century components of the landscape comprise National Grid power lines and a water pumping station. Recorded archaeology from such a large landscape area takes in a range of sites from all periods. 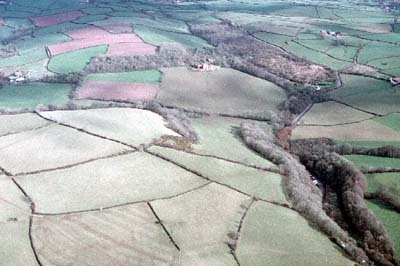 Features relate primarily to agricultural land-use but the Roman road and possible villa at Abercyfor, and the Post-Medieval lead mine at Cystanog, deserve note. There are some distinctive buildings. Iscoed mansion, rebuilt with brick facing between 1790 and 1804, is with its outbuildings Grade II listed, but semi-derelict; it features fine views across the estuary and retains some internal detail. Bryntowy Mansion, Llangynwr, built in the 1830s, is Grade II listed. The landmark medieval church at Llangynwr, without a tower, is not listed, nor are the largely 18th century Iscoed old mansion and Abercyfor House. To the west the tidal flood plain of the River Tywi, to the northwest Carmarthen town, and to the north the plain of the River Tywi provide clearly defined boundaries to this area. To area to the south has many similar historic landscape components to this area, and here there is a zone of change, rather than a clear defined border. The area which provides the southern boundary to the northern part of this area is characteristically distinct, but again a zone of change is present rather than a hard-edged border. To the east, historic landscape areas have yet to be defined.